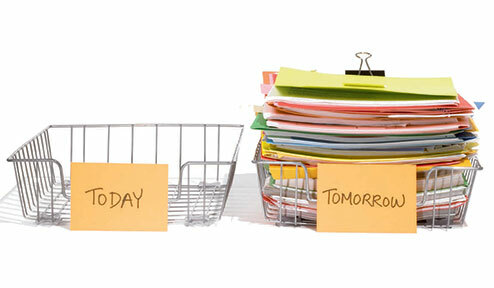 According to a phenomenon psychologists call the Zeigarnik effect, the human mind can only remember unfinished tasks. Like a song endlessly on repeat, chores left undone linger in the subconscious, expending precious cognitive energy until complete. In one experiment conducted by Florida State graduate student E.J. Masicampo, 2 groups of students were told to think about their most important examination: the first group was told to create a detailed study plan; the second group was told to simply think about the test. The control group was instructed to think about the most exciting upcoming event on their social calenders. Afterwards, participants were asked to fill in the blanks of several words. Those in the second group who did not devise a study plan were more likely to fill in the blanks with words relating to finals. For example, a student in the second group would be more likely to fill a four-letter word beginning with the letter “e” with “exam” than a student from the first group. Why? As the Zeigarnik effect demonstrates, creating a specific plan for executing our goals frees up mental energy for other cognitive undertakings. Those who simply thought about a daunting task (in this case, their most strenuous final exam) without developing a means of tackling it were subliminally controlled by the effects of procrastination. What does this mean for us and practical goal-setting? Masicampo’s findings suggest careful planning can liberate us from the persistent mental nagging associated with procrastination. If we outline how we will complete a task before actually completing it, we can focus more keenly on other matters. What’s essential here is that we don’t even have to finish the task: simply designing a systematic, step-by-step method for reaching our goals is enough to fend off the perpetual distraction of not having an item crossed off our to-do lists. For me, these results were both sensible and shocking, logical and counterintuitive. On the one hand, it made sense that items yet to be checked off our to-do lists badger our minds and subconsciously control our attention. Yet the idea that meticulous planning is freeing also seemed like a load of horseshit. Deadlocking myself into some preconceived notion of how my day was to supposed to go always felt more like a prison. Since I can remember, I’ve scolded myself for my obsessive scheduling because I thought such micromanaging behavior was a coping mechanism, a vulnerability shield, for dealing with the excruciating fact that, as humans, we have little to no control. Scrupulous hour-by-hour scheduling in my day planner, I believed, was proof of a major character defect, if not a full-blown pathology. I’ve always regarded my chronic fixation with time as a problem to be remedied rather than a talent to be applauded. “You’re too uptight,” I’d reproach myself, “Why can’t you just relax and be like everyone else?” But is it possible my penchant for planners is an asset rather than a flaw? According to social psychologist and vulnerability expert Brene Brown’s theory of a “strengths perspective,” almost all “flaws” are incarnations of our greatest strengths. When we reframe our most detested shortcomings as assets, we can see how they operate to serve us and, more importantly, we can cultivate a more forgiving relationship of loving kindness toward ourselves. Take my Type-A lunacy. From a self-critical perspective, I could view my rigidness and refusal to stray from schedule as evidence of my being high-strung, or I could understand it as confirmation of my commitment and follow-through. Same goes for my willful goal-orientation. I could view my obsession with setting and achieving goals as an unhealthy and detrimental addiction, or I could adopt the outlook that the single-minded pursuit of one’s goals is admirable. How we perceive ourselves depends on our perspective at a given moment. And the amazing thing about perspective is that we always have the power to choose. To return to Masicampo’s findings, science has confirmed time and time again that planning is critical to reaching our goals. So I suppose my fondness for calendars and day planners isn’t so bad after all.